I don’t know what kind of loser thought pisco sours weren’t frothy on top. Ah yes, that was me, in my last post just a few hours ago. Seems that a classic pisco sour DOES have white froth on top, formed by shaking egg whites in a cocktail shaker. Also seems I’ve mostly had crappy pisco sours most of my life. The one we had at lunch was at the Mercado Central – a place I dig but that no one would describe as ritzy. Anyway, I thought the froth was for chichi cocktail places like Employees Only in NYC but that’s actually the optimal way to do a pisco. Fail, cocktail friend, fail. Also, those three brown dots are dashes of bitters, which I was told was the Peruvian way to do it (even though yes, I’m in Chile). Anyway, it was fantastic. And if you have a pisco sour may the froth be with you. Tags: cocktail, cocktails, pisco sour. Bookmark the permalink. How very cool to know ! Thanks! So good as long as they’re done lightly and not sickly sweet. Reblogged this on Moments between seconds . The same is true of a good whiskey sour. The “true” whiskey sour is always made with egg white, is super frothy, and incredibly delicious. Most places serve the crappy version with sour mix and whiskey over ice, but if you ever have the opportunity to get a real one I highly recommend it! Yeah the mix is awful! And cheers. 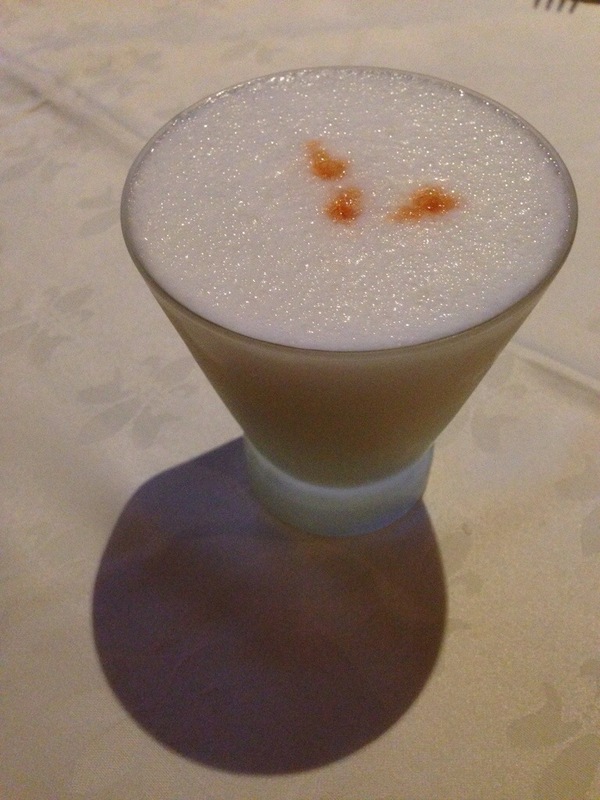 So excited that you blogged about the brilliant pisco sour cockatil! Born to Chilean parents myself and growing up drinking it as an aperitif before an asado, on the other side of the world, I just cant justify paying the ridiculous prices that the uber cool bars in Melbourne decide to charge for the drink, particularly when they tamper with the recipe in search of out cooling themselves…. oh how I wish they would just get it right…. now that I would pay for! Yeah, they really jack up the price at the fancy cocktail places. Very refreshing drink though. Interesting! Apparently there are lots of variations. All good if done well (ie not too sweet, in my opinion). Have had a few with froth here in Chile. Maybe they’re just cribbing, but they do it!